Signed: In pencil lower right "George Tooker"
at the Art Students League and studied with Reginald Marsh. There he met Paul Cadmus and a wide circle of writers, composers, dancers, and artists around Lincoln Kirstein, W. H. Auden, Christopher Isherwood, and George Platt Lynes. In 1959 the Whitney Museum of American Art acquired Subway, his first painting to enter a museum collection. 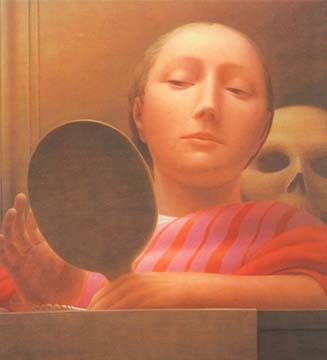 Mirror is a meticulous rendering by Tooker's hand of an image that he had painted sixteen years earlier. Time seemed unconstrained around George. The image still vibrated for him. Working for another publisher, Richard Newlin carried a lithograph stone to his studio. Never a prolific artist, Tooker painstakingly drew the image with lithograph pencil. 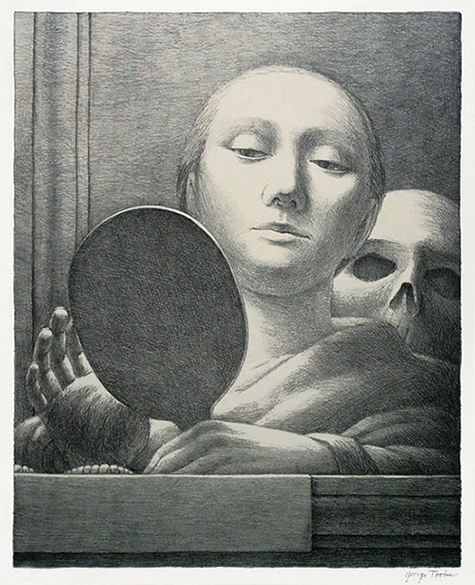 Mirror was the second lithograph that he had drawn. He was the loveliest and quietest of beings. He lived alone in a rustic house in Rutland, Vermont and cooked polenta for the printer with vegetables from his garden. Implications of a private life were everywhere.